This past Monday our good friend, Olivia Watts, hung out with us for the day since she was on spring break. The weather was great so we decided to go to the zoo........... I love seeing this hog sculpture when we're at the Little Rock Zoo because it reminds me of the summer in college that I spent in Florence, Italy. 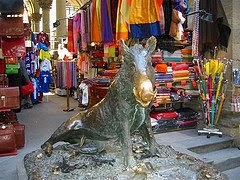 There is a very similar bronze hog in a street market in Florence. You are supposed to rub the hog's nose for good luck. It was everyone's first time to ride the newly restored carousel........ as you can see Ruby is wearing her "leash." I knew with Olivia being there Ruby would want to walk too. Olivia kept up with Ruby and I pushed Trip in the stroller. Thanks for a fun day Olivia!! These pictures are not in the order that I was hoping for....... does anyone know how to rearrange the photos in a post after you've uploaded them to Blogger? Anyway, Saturday night before Easter, Somer told me that Vivian had left out some Cheetos and ketchup for the Easter Bunny so I thought we should leave a snack for him as well. Ruby stuck with the more traditional bunny food of carrots and strawberries. The Easter Bunny decided to skip the candy this year. Fortunately Ruby didn't notice and was thrilled with the Fancy Nancy doll, book, Little Mermaid movie, and new Crocs for summer (they also have Little Mermaid and Cinderella jibbitz on them which were a major hit with Ruby). In fact, Ruby came running into our room around 4:30 am saying, "Mommy, Daddy, I got new Crocs! The Easter bunny brought me Crocs!"....... Trip's "basket" is explained in the previous "Trip's Tonka" post. Saturday we went to an Easter Egg Hunt at the local park with our neighbors, the Brzezinskis. Above is Gavin who is a couple of weeks older than Ruby and Morgan who is 5. We were surprised to see that Ruby loved the Easter bunny since she was not into Santa at all this past Christmas. When the bunny first came out Ruby even ran up to him and gave him a hug. Trip, as always, was Mr. Smiles and loved the Easter Bunny too. Trip with April Brzezinski. What a cute pic! I wish I had a picture that cute of me with Trip! Trip got a little sleepy and had some sweet, cuddly time with Daddy. Rex wanted to help the Easter Bunny with Trip's basket. Last night Rex comes home with this giant dump truck and my 1st thoughts are, "That is not going to fit in an Easter basket." Then, at 1 a.m., I'm sitting in the living room giving Trip a bottle (he has a double ear infection and hasn't been sleeping well) and Rex says he can't wait until Sunday and brings in the truck! Trip immediately wants down to go check it out and it's an instant hit. He LOVES it! We've hidden it away until Easter and hopefully he won't have already figured out the truth about the Easter Bunny................ and , fortunately, Trip did go back to bed easily soon thereafter. While Trip was napping (or atleast supposed to be napping- he doesn't feel good and has refused to go to sleep today), Ruby colored Easter eggs for the 1st time. I didn't want her to handle the dye on her own for fear of a major disaster so she colored them with crayons before I dropped them in the dye. When they were dry she put some stickers on them. I actually enjoyed it too. The smell of the vinegar and the sound of the color tablets fizzing was very nostalgic. Only 3 cracked eggs later, we have some colorful eggs for our Easter centerpiece. Ruby and I made Easter sugar cookies last night. I let her make them on her as much as possible so they're not the prettiest cookies ever but they're mighty tasty! She had a blast rolling out dough and putting sprinkles on everything, including the floor! We stopped by the park for a few minutes on the way home today...... Wahoo! It's been less than 24 hours and I've made another post! I'm baaaack! I have no clue what got into me tonight but I suddenly just decided to sit down and get caught up on this thing. I must say, I didn't enjoy it, so let's hope that it won't be another 6 months before I make another post. When I downloaded the new template it erased all of my links so please be sure to leave a comment so I'll have your blog address. This week we went to Memphis to attend the funeral of my Grandad's sweet wife, Ms. Ludie. She was a wonderful Christian lady and she will be missed. I'll never forget how much food she would cook when we'd come over for a visit. We'd take bets before we got there on how many different vegetables she'd have made!.......... The following day we went with YaYa to the zoo. It was Trip's 1st time to the zoo since he's been big enough to have a clue as to what was going on. It was also his 1st time to ride a carousel. In Ruby's world it is a sin to not ride a carousel if you see one. Mom and I were pleased that Ruby was content to ride it once and didn't have a breakdown when it was over. We had a good time overall but it was pretty hot and crowded so we didn't stay very long............... Oh, and while I was there I ran into my 1-semester roommate at Harding, Cassie Cummings. We didn't get to talk much because she was on her way out and her boys were worn out but it was nice to see her. I finally gave up on Trip having curly hair and decided that it was time to cut off the mullet that he had begun to sport. He was perfectly cooperative for Barber Dad. His clean-cut look makes him look like such a big boy! This was Trip's 1st snow and Ruby's 1st time to really play in the snow. We finally got to get out those snow boards my mom got us years ago and we found a great use for our sloped yard. Rex, April, and I secretly wished that the kids would go inside and let us have the sleds to ourselves. I felt like a kid again! I have so many pics of Trip's big grin that it's hard to narrow it down to a few. I liked that 1st picture so much that I had it made into a custom stamp for his birthday party invitation. We have really been enjoying gettnig to know our neighbors from across the street, the Brzezinski's. Gavin is ALL BOY and is getting me prepped for Trip. This night, Gavin and Ruby decided to have an apple juice spitting war. Fortunately they had already taken their clothes off for some reason so I just had to mop the floor. Ruby LOVES her Dora vanity! She calls is her banity. Trip was Mr. 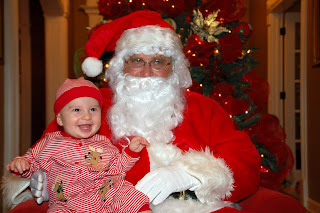 Smiles for Santa but Ruby wanted nothing to do with him. This was the best pic I could get of both of them together Christmas morning. Of course, they were too busy with all the new toys. 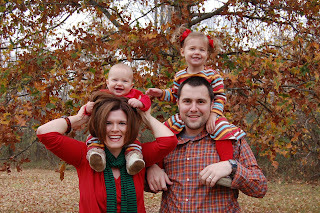 This was taken on Thanksgiving and was our Christmas card pic. Ruby was too cute in her pigtails and sunglasses this fall day at the pumpkin patch. There's October-December '07 in a very tiny nutshell..... For Halloween T&R were going to be matching dinosaurs but Ruby wanted nothing to do with the dino costume. She looked equally cute as a Razorback cheerleader.